Sealaska Heritage Institute (SHI) is applauding the return of Tlingit Mary Miller as the superintendent at Sitka National Historical Park. Miller, who earned a civil engineering degree from the University of Alaska Fairbanks and an executive Master of Business Administration from the University of Washington, is wholly qualified for the position and personally represents the history of the park as a Tlingit of the Shangukeidí clan with some Russian heritage, said SHI President Rosita Worl. Miller also helped spearhead projects to perpetuate endangered Northwest Coast art practices when she previously served as the park’s manager, Worl said. “She was a pivotal figure in SHI’s effort to form a mentor-apprentice team in Sitka in recent years to pass on the endangered knowledge of how to make traditional dugout canoes. We are happy to have her back and know she will excel as superintendent of the park, which is the ancestral homeland of the Sheet’ká Kwáan,” Worl said. 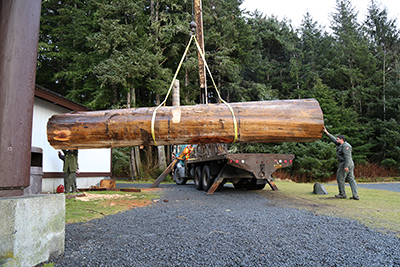 Caption: Crew unloads log used for SHI’s recent master-apprentice program at the Sitka National Historical Park. Miller helped coordinate the project, which passed on the endangered knowledge of how to make traditional dugout canoes.